Elvis Unlimited has again produced a book about Elvis. This time they have collaborated with Ger Rijff from The Netherlands. This duo has already given us The Hottest Thing That's Cool, a HIGH quality product from beginning to end. My Wish Came True can in general be compared to The Hottest Thing That's Cool. Both deals with Elvis' early 50's period, sporting different LP covers, magazine covers, ticket stubs and other memorabilia. Trevor Cajiao - known from Elvis The Man And His Music - also contribute in both books. "The Hottest Thing Is Cool" was released in hardbound cover, while "My Wish Came True" is a soft cover release. The paper quality is better on this last release, though. Such details are important, thick paper gives an odour of quality. The books three chapters are called "Local Boy Makes Big", "Rockin' The Nation!" and "Hollywood, Here I Come". You will find photos of Elvis' acetate master of 'I'll Never Stand In Your Way', newspaper articles and comments from other known artists. 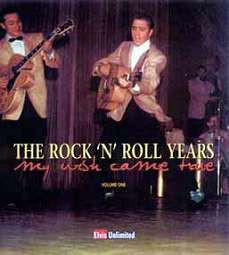 The foreword is pretty describing; "What you're about to read are memories from Elvis' contemporaries - mainly fellow performers who worked with him / were influenced by him during the heady days of the mid-1950s, offering insights into just exactly how he shaped a generation and the impact he had on social culture. He changed not only the recording industry; he changed the way people dressed, the way people spoke - even the way they combed their hair! As Conway Twitty so succinctly put it; "He changed the whole damn world""